A good friend and occasional commenter here, Greater Czarina (a.k.a. 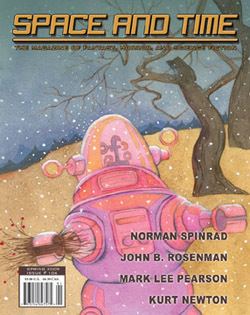 Hildy Silverman), happens to own and publish and operate a great quarterly magazine called Space and Time. It’s been around for more than 40 years, and deals in what she calls “strange and unusual fiction, poetry, and art” of the fantasy, horror, and science fiction variety. As somebody who mostly reads genre fiction these days, when Hildy bought the book a few years ago, I was thrilled by the news. I’ve really enjoyed reading the issues every few months, and really really enjoy knowing somebody WHO OWNS A MAGAZINE. Seriously, how cool is that? Another personal bonus is that Space and Time gave me the opportunity to live out a lifelong dream — writing a comic book. Well … half a comic book anyway. A 10-page story that has played out over the course of a year, and was illustrated with much brilliance by Jeremy Simser, another good friend of mine who draws storyboards for a living. The final 4-page installment appears in Issue #106, which hits the shelves any day now. So visit the website — which I recently redesigned — and learn how you can subscribe to this magazine, read some great fiction and poetry, and support a fellow gagglefrakker. Edited to add: I just added to the site the first 6 pages of the comic story. Enjoy!